THE SOCIAL STEREO- A BOOMBOX THAT CAN TALK TO OTHER BOOMBOXES. We are building a revolutionary new Open-Source Boombox that can communicate with other boomboxes and will enable people to come together and create infinitely-scalable Decentralized Sound Systems. This is a device which will alter the course of history. The inaugural Restive Geek PowWow went down at BURNING MAN, and a second one was held in New York City on Sept. 15th. Send an email with subject text “SOCIAL STEREO” to: info<at>SocialStereo<dot>com to receive updates and get involved in the online/offline Research and Development. And while you’re here, check out Another Very Inspiring Open Hardware Project. More info will be posted soon! 17 Responses to THE SOCIAL STEREO- A BOOMBOX THAT CAN TALK TO OTHER BOOMBOXES. Are there cheaper Solutions than this? Sweet. Discovered this page via the Burning Man Google Map. So I get how stuff is received, but I’m confused as to how it’s transmitted. If the set up is designed to all transmit to one station, how do people compete to be the source that’s listened to? And if those listening have the option to choose whether they listen to you or someone else, how is this different from traditional short-wave radio? Maybe I don’t get it at all. I’ll be sure to stop by your camp and check it out! Our friend Paul Freedman (aka: Fossil Fool) has experimented with FM-transmitted amplification for his annual here in San Francisco with some success. We have been experimenting with different solutions for our FlashBLOOMS (like the one you ran into on the Highline in NYC). We’ve tried: using bluetooth on iPhones to stream a curated FlashBLOOM radio station to a small jellyfish-mounted speaker, the “everyone hit play now” that uses for their roaming boombox caroling events. None is perfect. 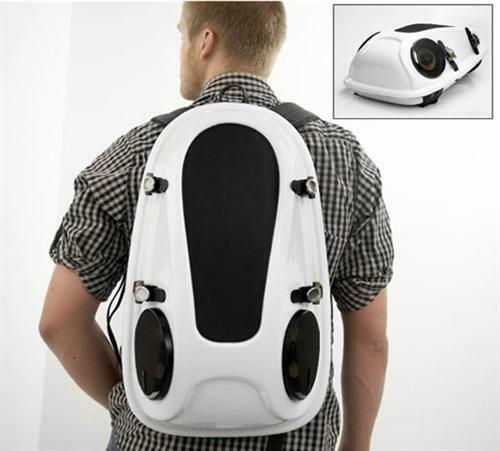 What BJB really needs is a speaker backpack (like this ) that can be worn by our performers with a range of 50 feet. fantastic idea. i really hope this will happen. the boombox must not outdate! Mind blowing idea! If I were smart enough I would happily design you a beautiful, sleek, Arty McFly/teenwolf in a speedo jambox. But since I can’t I’ll just do the best I can to get the word out. Good luck! Awesome- did you submit to the mailing list?? I would like to get involved in the social stereo project. If you have plans for a prototype I would like to build one and see if I can offer ideas for enhancements. Isn’t a social stereo AKA FM Radio??? Need be state wide, AM radio. World wide internet radio? ?